I struggled to find PEM resources for my CT3 year, despite the variety of excellent resources out there. I hope this website will help point you in the right direction. 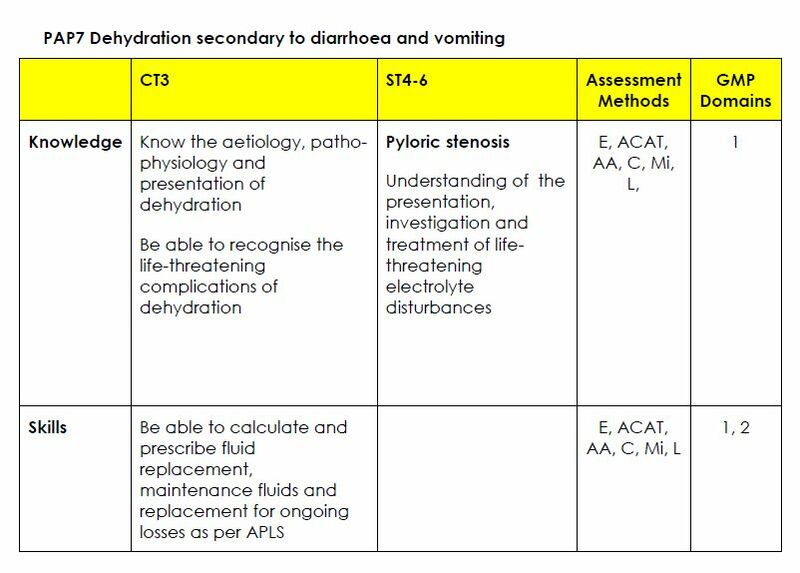 I'm not a PEM expert, but am following the guidance CEM have issued (in the form of a syllabus) to put together this page. This page is not endorsed by CEM, and any mistakes are mine. Please comment with corrections, additions and further suggestions. All the information here is collected from the internet, and it might be out of date or inaccurate, so please use your judgement and adhere to your hospital's protocols. If you do notice any errors or omissions please comment so we can put them right! To navigate, decide whether you want to start with a PMP or a PAP. You can then select which PMP or PAP you want to look at. You will then be taken to the summary page for that PMP, with links expanded topic collections. If you know what topic you want to look at already, click on the link on the right hand side. Nasal foreign bodies are surprisingly common. The technique is not too dissimilar to that of removing auricular foreign bodies. In theory, they might be hidden behind a turbinate and tricky to see - and therefore tricky to remove. This works in 60% of cases. Occlude patent nostril. Get Mum to blow into the mouth. You can do this with a BVM if needed - but be careful the pressure isn't too high. Like with FBs in the ear, gentle suction, can help. I guess glue could too - although I haven't seen any case reports of this. If you can't find one, as we can never find them in the ED, bend a green needle, and that should help! Inflate baloon with 0.5 - 3ml water or air. Insert it behind the foreign body, and then pull. I've never tried this, but it seems to be really frequently used outside the UK! Extracting foreign bodies from the ear can be very painful, and it is easy to impact them where the auditory canal narrows. 75% of patients with ear foreign bodies are younger than eight. - Check if there's a tympanic membrane perforation. If you can't see whether there is or not, that makes things trickier. - Consider anesthetising the ear - some lignocaine dripped in may well help. Blocks don't tend to be too helpful - if this fails, think about general anaesthesia or sedation. - Check whether you should be removing this. ENT should help with button batteries, sharp objects, tightly wedged FBs, and FBs you can't remove after multiple attempts. - When successfully removed, double check you've removed it. Consider prophylactic antibiotic drops. If the FB is "graspable" this can be useful. This is especially useful if there is a live insect in the ear. The insect must be killed with alcohol, 2% lignocaine or mineral oil - but hopefully you can check there is no tympanic membrane perforation first. Once the insect is dead, suction might remove it more effectively than grasping or forceps as this can cause shedding. Until the insect is dead, remember it might try to fly towards the otoscope light - this can be uncomfortable for the patient! Don't irrigate button batteries in the ear. Don't irrigate organic matter that might swell, and get wedged. Don't forget to use warm water - as the patient won't thank you if the water is cold, as it can cause vertigo and vomiting. If you're having trouble directing the irrigation, think about getting a cannula (needle out) connected to a syringe (that you can gently flush). We don't have microsuction like ENT do, but cutting a 12Fr suction catheter short, and then applying gentle suction, may help. Equally, cutting the soft tubing from a butterfly needle, and using that for suction may help. A bit of wound glue on the end of a syringe or Q tip can adhere to the foreign body and pull it out. You're going to have to be pretty convinced you're going to get the Foreign Body out, and not just stick the FB further to the ear canal! If you do this, it might be worth putting an ear speculum on the foreign body, then guiding the glue in that way - it protects the rest of the ear canal. You really do need a compliant patient. A small magnet may help remove a magnetic foreign body. Femoral fractures are uncommon, as considerable force is often required. There is often a history of a fall with the leg twisted awkwardly. In children fractures are more common at the physis, and we need to know about the "SALTER" classification. There is a bimodal distribution of femoral fractures - they are common in 2 - 4 year olds, and adolescents. We should always consider child abuse and non accidental injury, especially if the fracture presents in a patient before walking age. Most sources agree that splinting should be carried out as soon as possible, although practically this can be difficult. I have written a presentation that says all this with pretty pictures. Emergency Care of Minor Trauma in Children. Ffion Davies et al. Drainage of an auricular haematoma is one of the "new" practical procedures that has popped up on our e-portfolio. This is difficult to get signed off because there are minimal resources on it, and it's not a skill I've ever seen performed in the ED. I'm not sure if it's because I'm missing them, and not looking hard enough for them, or if it quite simply isn't a procedure we do in the ED. I've seen ear lacs and swollen ears - I must be missing something. What is An Auricular Haematoma? An auricular haematoma is a collection of blood that forms between the cartilage and the perichondrium of the ear. It is most often caused by blunt trauma to the ear. Needle aspiration is often recommended. This failed in 75% of cases - maybe because the needle itself introduces haematoma. Incise along an anatomic crease to avoid a scar. Use forceps to encourage all of the haematoma out. Put a drain in, and then a dressing for compression. Prophylactic antibiotics have no evidence. 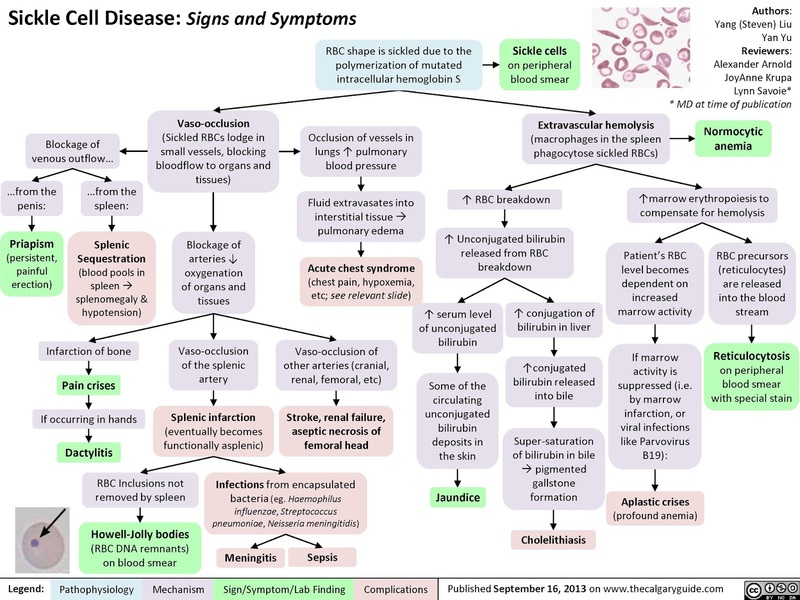 Sickle cell disease is really common where I work and I've seen lots of different presentations. Our management seems a little different, and more rational, than some of the guidelines I've found on the internet - it was an interesting literature search. Once again, the Calgary guide explains this better than I ever could. Sickle trait - increased renal cancer but no "disease"
HbS is less soluble so might precipitate. This means they become sickle shaped. Can be precipitated by dehydration, hypoxemia or acidosis. Have you looked at the Calgary guide? It is a very under-rated resource. A painful crisis is the most common presentation to the ED for sickle cell. Vaso-occlusion causes many problems - priapism, splenic sequestration, dactylitis, splenic infarction, stroke, renal failure, necrosis of the femoral head, blockage of the lung vessels and painful crises. Painful crises are more common in the limbs and backs. The pain is normally throbbing, sharp or gnawing. - Splenic infarction means RBC not removed by the spleen leading to Howell-Jolly bodies on blood smear. - Aplastic crisis causes anaemia, pallor, tachycardia and a low reticulocyte count. - Extravascular haemolysis causes a normocytic anaemia. As the red blood cells breakdown, there can be jaundice, and increase in gallstone formation. There can be increased marrow production to compensate for haemolysis. Develops in 15-35% of children with SCD. This is most common in children, especially at around age three. It presents with fever, chest pain, difficulty in breathing and shadows on CXR. 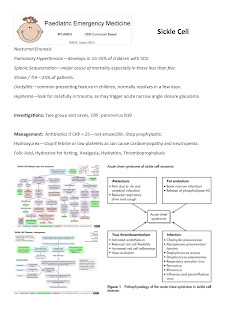 Need to treat the pneumonia / infection and have urgent transfusion. Be careful as overhydration may lead to oedema and pulmonary vascular congestion. This is a major cause of mortality, especially in those less than five years old. Major causes a rapid drop of Hb, pallor, LUQ pain, splenomegaly. Minor is more gradual onset. Strokes are common - up to 25% of patients. They need urgent imaging, and urgent exchange transfusion. This is often the presenting feature in children, and normally resolves in a few days. If there is any eye trauma, look carefully for a hyphema - it may not be obvious. Refer anyone who has protrusion of the eye, changes in visual acuity or loss of vision. Patients with sickle are risk of hyphema triggering acute narrow angle closure glaucoma. Two group and saves if transfusion likely - patients with sickle cell likely to have abnormal antigens. D-dimers are unhelpful as levels are usually elevated. 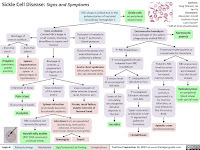 CXR, ABG, LFTs (jaundice or abdo pain), reticulocytes, blood and urine cultures (if febrile), USS abdo, parvovirus B19 serology (Hb drop, low reticulocytes Transient red cell aplasia (TRCA) is caused by infection with parvovirus B19, which causes red cell production to halt for 3-7 days), brain imaging, limb x-rays, CRP. 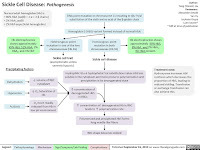 Consider serology for atypical respiratory organisms and urine for pneumococcal and legionella antigen. Look for mycoplasma infection - red cell agglutination on a stained blood film and cold agglutinins in serum. Look for parvovirus B19 - erythema infectiosum or slapped cheeks, gloves and socks syndrome (painful erythema of hands and feet), arthropathy, aplastic crisis. Oxygen - only if sats are low. Antibiotics - really consider antibiotics if CRP>25 - but not amoxicillin as it is so similar to pen v - consider co-amox or tax. Stop prophylactic antibiotics if starting regular treatment. Prophylactic penicillin should be used in children until five years old, unless they had a splenectomy or invasive pneumococcal infection. Transfusion - consider. If Jehovah's witness need transfusion, go ahead as per normal, then contact legal department who arrange out of court hearing and you can normally transfuse them within an hour! And most parents are happy because they've done their bit. Hydroxycarbamide (also known as hydroxyurea) - stop if febrile or low platelets as can cause cardiomyopathy and neutropenia. Hydroxyurea - more than three crisis in twelve years, or sickle cell-associated pain, or any infants older than nine months. 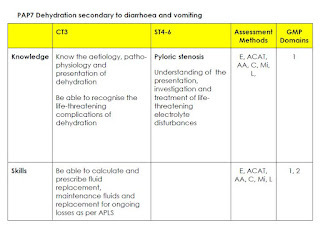 I've probably missed something, but PAP7 seems very similar to dehydration in children. 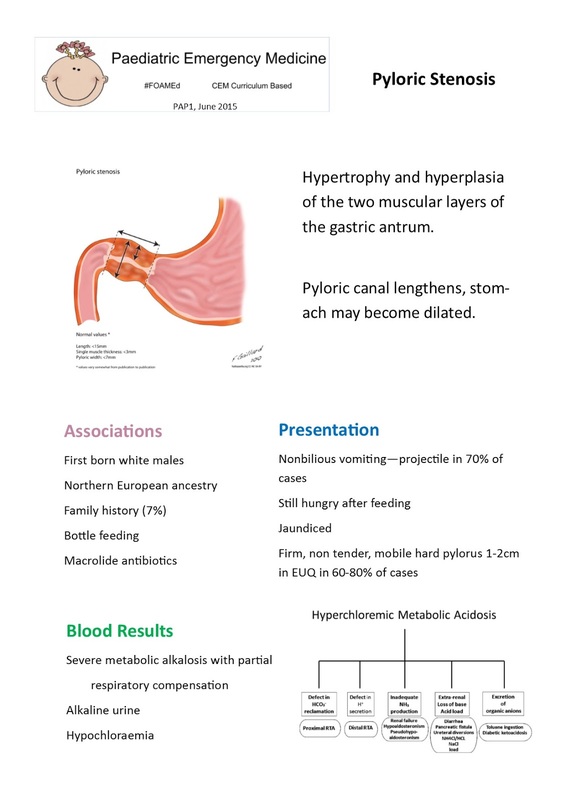 The new bit is pyloric stenosis, also known as hypertrophic pyloric stenosis, which we'll cover here. 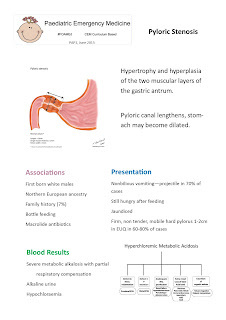 There is hypertrophy and hyperplasia of the two muscular layers of the pylorus. This labels the gastric atrum. The pyloric canal becomes lengthened and the whole pylorus becomes thickened. The stomach may then become markedly dilated. Pyloric stenosis normally starts in the first 3 weeks of life. Non-bilious vomiting or regurgitation - projectile in 70% of cases. The infant is still hungry after feeding and may be jaundiced. Signs of dehydration and malnutrition. Firm,non-tender and mobile hard pylorus 1-2cm in the RUQ. Best palpated when vomited and calm. Happens in 60-80%. http://broomedocs.com/2013/02/clinical-case-079-is-it-pyloric-stenosis/ may be useful - their server is still down so I haven't read it yet! 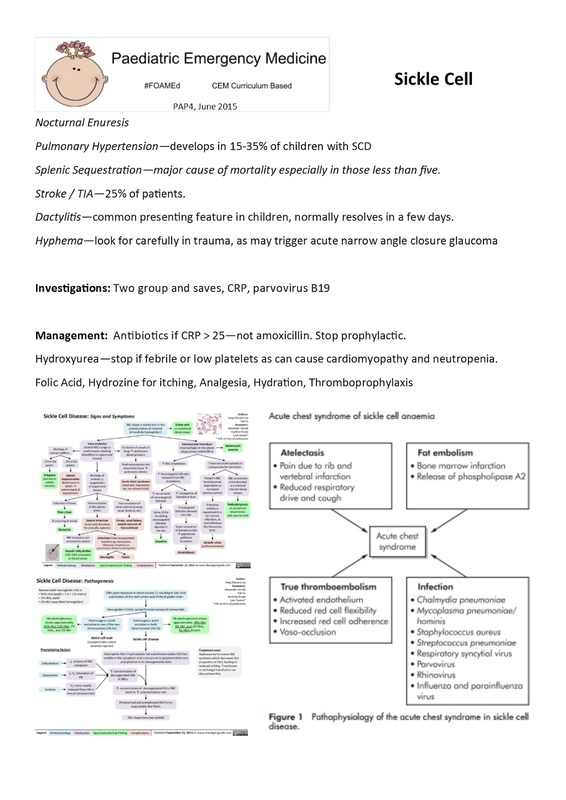 Paediatric Emergency Medicine. Ethereal theme. Powered by Blogger.